The members of the group from Brazil were very aware of Hadassah’s philosophy of providing outstanding care for all who come to the Hospital, regardless of ethnicity, religion or nationality. 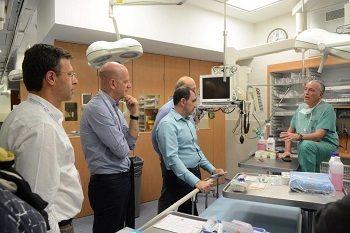 They had been in Israel all week, and had followed the news which had highlighted Prof. Rivkind’s life-saving role in each one of the tragic incidents. Hadassah, once again, was at the forefront of dealing with mass casualties of war and natural disasters. The group, which had come on a Solidarity Mission and educational program organized by the Jewish Federation of Sao Paulo, included the top leaders of the major Jewish organizations of Sao Paulo. It included leaders of the Albert Einstein Hospital, the Jewish Charity Fund, synagogues, schools, Jewish Foundations and others. During their week-long Program, they had learned about the strategic challenges that Israel is facing both today and in the future. By coming to Hadassah, they were able to gain a perspective of the critical strategic role that Hadassah plays in making sure that Israel is prepared for the security threats the country faces. Visiting the underground floors of the Sarah Westman Davidson Hospital, they had a chance to see the still-to-be-completed Underground Operating Rooms. 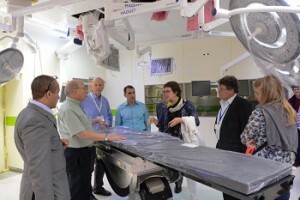 Jorge Diener from Hadassah International described those floors as the “Iron Dome of the Health system” in Israel, a metaphor that helped them to grasp the importance of these surgical units that are bunker-protected, and are vital for Jerusalem and Israel in the eventuality of a biological and/or nuclear war. Accompanied by Professor Charles Weissman, Head of the Anesthesiology and Critical Care Unit, they had the opportunity to see a sample state-of-the-art operating room that has been equipped and completed, while at the same time understanding the importance of urgently completing the remaining rooms that haven’t been finished due to lack of funding. Because operating rooms must be sterile and cannot be used while there is still construction dust around, the suite of operating rooms cannot be used until all the operating rooms are completed. The visit definitely strengthened the already warm relations between the Jewish Community of Brazil and Hadassah. 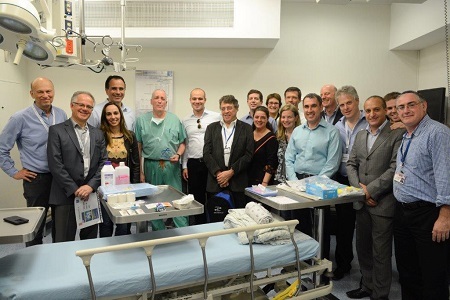 It also represented another milestone in the cooperation and partnership between Brazilian Jewish leaders and the Hadassah Hospital, one that has opened new venues for securing health, peace and caring for all, in Israel, in Brazil and elsewhere.